Amos Miller is a founder member of internationally acclaimed brass quintet Onyx Brass, and has combined the post of principal trombone with the Royal Ballet Sinfonia (orchestra of Birmingham Royal Ballet) with a busy freelance career in which he has worked as guest principal trombone with some of the country’s most acclaimed orchestra’s including the London Philharmonic, Philharmonia, BBC Symphony, BBC Concert, Royal Philharmonic, English National Opera and Royal Opera House Orchestras. He is also in demand in the studio and has played for over 100 film soundtracks, including ‘Lord of the Rings’, ‘Harry Potter’ and ‘Mission Impossible’. What inspired you to want to play the trombone at the age of 9? I was a loud small boy and wanted to play something that I perceived as noisy. I also saw an inspring concert by Canadian Brass when I was 8. We have tried very hard to cement the place of the brass quintet as a genuine and serious vehicle for chamber music. To that end we have premiered over 200 new pieces! 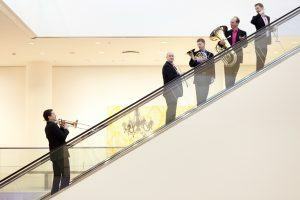 Onyx Brass celebrated 25 years as a quintet last year, as a founding member what do you think is the reason for its success? I think it’s a combination of all being friends, and that, hopefully, we are a group who present and play equally well. As individuals you also perform with orchestras, a very different experience to when you play as a quintet, does a combination of the two enhance your performances? Yes, definitely, it stops anything becoming stale. What do you hope that an audience takes away with them after a performance? A sense that they have had a lovely time! And that the performers have enjoyed themselves too. You’ve performed all over the world, from the most splendid opera houses to bandstands in parks, what do you take from this diverse range of performing experiences? How to deal with any situation or acoustic! Education is a key feature of Onyx Brass’ remit and you visit schools, how important is it to expose a young audience to music today? Utterly critical. In these short-sighted short-termist times, where arts provision is deemed unnecessary, we have a massive responsibility to share the joy that is music to every new generation. It is humanity’s greatest achievement, and has been repeatedly shown to improve the outcomes for children in every aspect of their lives. What can we expect from your programme at the Dulwich Festival this year? Variety, beautiful sounds, approachability, virtuosity. Onyx Brass are described as playing challenging pieces yet as still being utterly accessible to the audience, how do you achieve this? There is a major disconnection between audience and performers in many classical music arenas: even the attire of the performers can be a barrier: evening tails, for example, were only historically worn by musicians to make their audiences feel comfortable as that was what they were wearing. It is somewhat anachronistic to wear them now, and it can make the musicians seem aloof. What has been your most challenging moment to date? As a group? Probably being on a runway at Dulles airport in a hurricane!